Let me level with you; I've been researching for / trying to produce a calendar for the past 3 years. At the start of 2015 I wrote down CALENDAR: TO PRINT BY END OF OCT, planning to sell my long-awaited creation at a couple of markets before the end of the year. That didn't happen, but I did manage to squeeze out the final artwork just in time for Christmas, sending it to Rope Press on a bit of a wing and a prayer. The concept was born out of exploring Wikipedia's notable event listings, which are sorted chronologically by year on 365 individual web pages. Using this method to look something up, I soon found there was all sorts of things in the mix that made me laugh for various reason, largley because they weren't in any way as remarkable as the bloody battles, natural disasters and celebrated inventions which they sat alongside. 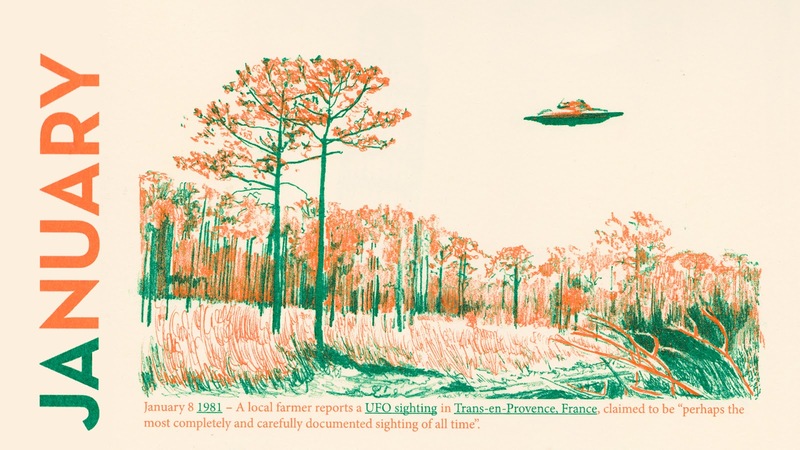 For example, the page for January 8 lists that on the date in 1981 – A local farmer reports a UFO sighting in Trans-en-Provence, France, claimed to be "perhaps the most completely and carefully documented sighting of all time." This cocktail of solid and internet-grade facts using words like "claimed" and "perhaps" was of great interest to me, and just told an excellent story about how we record instances from throughout history. 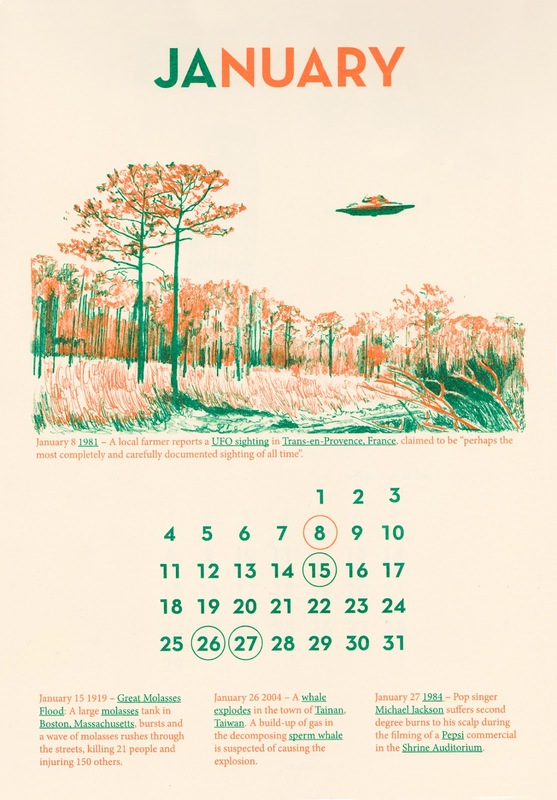 I scoured all the dates to find curious points of interest, my favourites presented in the calendar as a fully illustrated askew history of humankind. 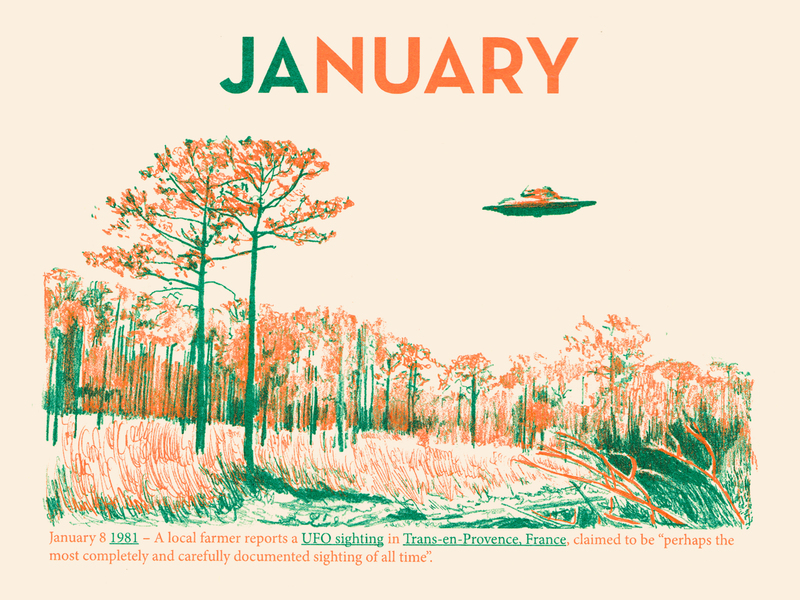 Whilst UNREMARKABLE was designed as a gift to people I've worked with, I've also made a couple of calendars available through my Byng Inc. online shop for £10. You can also download the January artwork as a desktop background in wide screen (1920 x 1080) and full screen (1600 x 1200), updates of which I will post each month.